Have you heard the buzz on Years of Living Dangerously – the Showtime series on climate change? Now is your chance to watch the series premier and help move the conversation on climate change to the next level. Featuring poignant stories of communities facing the impacts of climate change across the globe, investigative-journalism style reporting with leading conservationists and reporting from the field, and breathtaking cinematography, Years of Living Dangerously is poised to start new conversations about climate change and mobilize people to action. The series is a powerful learning opportunity for students—who are the next generation of wildlife conservationists and climate activists—to analyze the science of climate change, learn how to distinguish facts from opinions, and investigate solutions. The National Wildlife Federation was asked to team up with Years of Living Dangerously as the official educational partner of the series. We are providing educational resources and learning opportunities on the issues presented in the series for middle school, high school, and university students and instructors. Visit our Climate Classroom site to share the series and learning opportunities with the students, teachers and parents in your life to help develop you peoples’ leadership skills and environmental knowledge that is necessarily to successfully confront the challenges before them. Together, learners of all ages can share their own stories and investigate climate change impacts and prompt solutions in their community. You can join others near you this Sunday evening at house parties to watch the series premier. Our friends at 350.org are helping people across the country organize house parties where people can come together to share this experience with their friends and neighbors. Find a watch party near you or host your own. 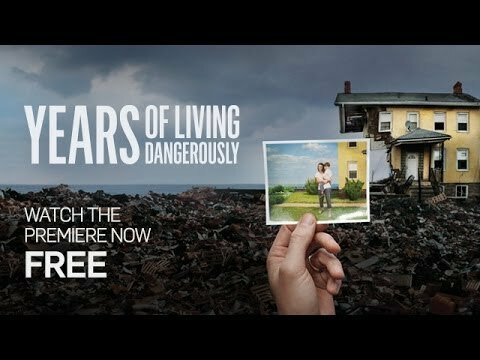 After the series premiere, log onto the Years of Living Dangerously Google Hangout to engage directly with the producers, scientists and celebrities in the show—including Ian Somerhalder, Bill McKibben and MSNBC’s Chris Hayes. Cutting carbon pollution from U.S. power plants that burn fossil fuels is a critical piece of fighting climate change. Right now, the Environmental Protection Agency is moving forward to address the carbon pollution from the coal fired power plants across the nation by setting strong limits on carbon pollution that power plants emit—and the EPA needs to hear from you. The dirty fuel industry is using its tremendous profits to misguide the public on climate change, and stall action by our leaders. But, we can show the overwhelming support for action on climate change to protect wildlife and communities across the U.S.—and across the globe. Speak up for wildlife facing the impacts of climate change—urge the Environmental Protection Agency to finalize strong limits on carbon pollution.